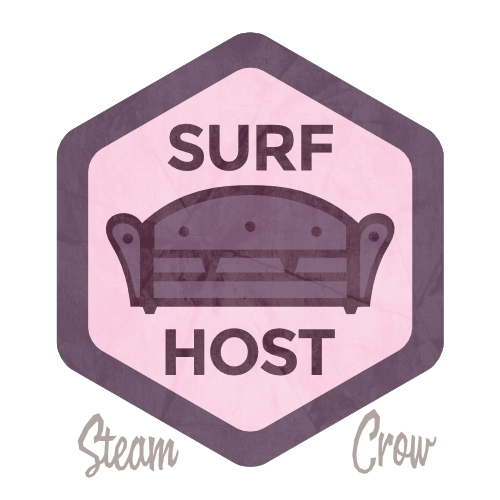 The Surf Host Spirit Badge is offered to those fine folks who host the Steam Crow Crew in their homes – on our various adventures, conventions, and treks. Doing these events is costly, but by hosting us you help keep our costs down and keep our success attainable. Thank you! Well, if you hear that we’re traveling to a certain region and have a safe, clean place to host us, let us know. Know that we’re booking this stuff out about 9 months out. There is just 1 level of the Surf Host badge, though it could be tiered at some point. We’re not allergic to cats, though we are a non-smoking clan. We are thankful for everyone who has helped us out over the years. We can bring sleeping bags and such; just let us know what you’ve got. Shower access is pretty important to us. This physical badge is worth 300 Glory points. The Couch is the international symbol for Couch Surfing. This is a rare badge since we only sleep in other folks homes, infrequently. But man, does it help.